We are pleased to present the 2019 3FC! Check-in will be in San Luis Rio Colorado, SON MEX, located across the border from Yuma AZ. SCMA will continue the “Return to Mexico” for the third year in a row! Take your time to glance through each of the items listed on the drop-down menus and learn about the history of this magnificent ride, the route we will be taking this year (final route sheets forthcoming), information about border crossing into CAN and MEX, eBlasts previously released with ride info, photo’s from previous 3FC’s, and links to information on weather conditions during this 4-day event. Website pages may not be populated early in the year but will be as information becomes collected. This event is NOT a race. No records are kept in regards to elapsed time. This event is a 6-day event with a registration day, 4 days of actual riding and the day of the finish banquet. It is an endurance event where riders may be exposed to extreme cold, rain, snow, sunshine, extreme heat, road closures, and more. Riders are presented with a preferred route but can ride any route they choose, as long as they reach 3 checkpoints and the finish point within the designated times. 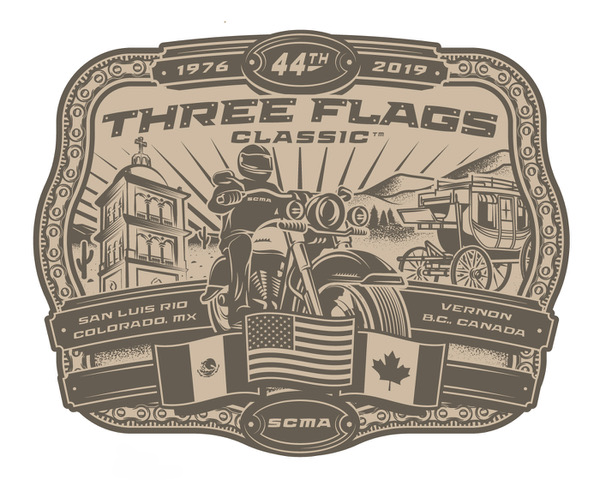 At the time of registration, riders will receive a starter’s package usually containing a plaque, 3FC passport, preferred route sheet, decal, pin, shirt, and cap. Check-In Day: Thursday, Aug 29th, is for Event Check-In, start banquet, rider’s meeting, and first timer’s meetings. Day 4: Monday, Sep 2nd, is the main finish date. Riders arriving before the close of the checkpoint at 9:00 pm, and meeting passport stamp requirements, will receive a Finisher’s Buckle. Day 5: Tuesday, Sep 3rd; Finish Banquet. There is usually a Happy Hour on Tuesday before the banquet around 4:00 pm, with the banquet doors usually opening around 5:00 pm. More information about the route, checkpoints, hotels, etc. will be published as it becomes available. Routes, checkpoints, dates, and times are all subject to change. See you in SLRC !!! Also, visit our Three Flags Facebook page.